One of my favorite stories, just the thing to read for Halloween, not that it is particularly scary, but it does have a dark atmosphere and a cool supernatural conceit involving wishes and an imp. Like The Monkey’s Paw which I just reviewed earlier today, the story is underpinned by the theme of “be careful what you wish for”. Having said that the way wishes work in The Bottle Imp is much more complex and interesting than The Monkey's Paw. Basically whoever possess the bottled imp can make an unlimited number of wishes, but they must sell the bottle for less than the purchase price before they die, otherwise they will burn in hell forever after their death. That doesn't sound like much of a challenge, selling things at a loss is easy, it’s making a profit that is always a struggle. However, Robert Louis Stevenson cleverly explores the practicality of reselling an item that reduces in value until it reaches the ultimate price level of zilch. If you have all your wishes you want, but you bought the bottle for a single penny what would you do? 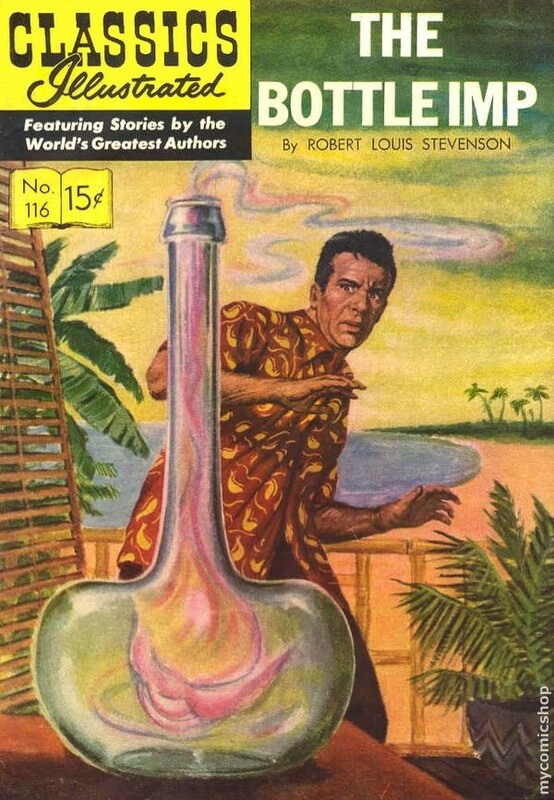 The protagonist Keawe thought he had it made when he was able to sell the bottle after being granted a mansion and a servant by the imp. Unfortunately after selling the bottle he is afflicted with leprosy just when he is preparing to marry the beautiful Kokua, the love of his life. His only hope for a cure is to buy the bottle back from whoever has it now. Tracking down the bottle is not particularly challenging, and buying it is all too easy. The problem is that the selling rice is now extremely low, fortunately, his wife Kokua has the brilliant idea of going overseas to a country where the currency has a lower minimum denomination than in the US. So off they go to Tahiti a “centime” is worth less than half of a penny. You will have to read it to find how it all turns out. Though not as legendary as Stevenson’s classic [b: The Strange Case of Dr. Jekyll and Mr. Hyde|51496|The Strange Case of Dr. Jekyll and Mr. Hyde|Robert Louis Stevenson|https://d.gr-assets.com/books/1318116526s/51496.jpg|3164921], The Bottle Imp is a very entertaining and thought-provoking story, the morality of selling such a bottle is, after all, questionable. It is whimsically narrated in the style of a folk tale, and the conclusion is nice and satisfying.